Raise your hand if November is one of your favourite months of the year!... What, nobody? Just me?? I seriously LOVE the month of November and I'd put it up there with July or August. Yep, for real. Why do I love one of the darkest months of the year? A month where everything is brown and gray, void of new life, and without green grass or leaves on the trees? - good questions, right? Why love the month of November? How do you fall in love with the gray season that is the month of November? Every season is special but November is just awesome! For me, November is the month where my skis come out of hibernation, my snowshoes get dusted off for a fresh new season and I get to skate again after a long 8 months without ice. The sleds come out, the old balance bike gets its skis put back on for another winter of ski-biking, and we get to make our first snow angels. What's not to love about November?? What's not to love about November? Highwood Pass is the highest paved pass in Canada and is accessed via Highway 40 in Kananaskis. Thanks to its elevation of 2206 metres, there is super awesome early season snow. This means you can go snowshoeing here in November and find soft fluffy powder that you normally wouldn't see elsewhere until January. And the road is only open until the end of November so go now! There are two trips that we enjoy doing each November in the Highwood Pass area. The first one, Ptarmigan Cirque, has to be done earlier in the month before avalanche danger climbs too high. (We like to go the first weekend of November.) We always include at least a couple adults in our party with winter backcountry training to ensure we stay out of avalanche danger, but in general you just don't hike too far back into the cirque. We hike up the trail until we reach the cirque, let the kids slide down the first glacier moraine (because backcountry tobogganing is a blast) and then we hike back down. To read about last year's adventures (and to see more photos) follow this link to November Hiking and Backcountry Sledding. And please check with a visitor centre before heading up here to inquire about avalanche conditions. If you doubt your winter backcountry experience, choose Elbow Lake instead (below) which has no risk or danger from avalanches. The second snowshoe trip we like to do each year is to Elbow Lake. This trail is short in distance, wide enough for sleds and Chariots or pulks, easy for little legs, and has no avalanche risk as long as you don't go too far past the lake. It's a great family trip and we usually do it towards the end of November so that we have lots of fluffy snow! To read more about our annual trip to Elbow Lake (and to see more photos) follow this link to Family Snowshoeing Adventures - Elbow Lake. There was lots of snow at Highwood Pass in November, 2013! This is my number one favourite reason that I LOVE November. We usually get a brief window where some of the lakes in Banff National Park have frozen over enough to skate on, and have not had so much snow yet that you'd have to shovel them off. When we do get a skiff of snow, Banff locals are usually pretty good at getting out onto the lakes and clearing paths around them to skate on. Love those people!! I've written a lot of stories on November skating in Banff so I encourage you to check some of them out if you'd like more information on where and when to skate. There are also tons of fun photos. Follow my Facebook page and I promise to keep you updated on skating conditions in Banff. It's a very short season and sometimes it only lasts a week before there's too much snow and you can only skate on artificial rinks or small ponds. For other skating options, please follow this link to the Banff National Park website. It's hard to find good snow for skiing in November but I've consistently found enough snow to ski on at Lake Louise by mid to late November. One year we even made it into Paradise Valley for some light touring and the snow was as good as anything I've seen in February!! 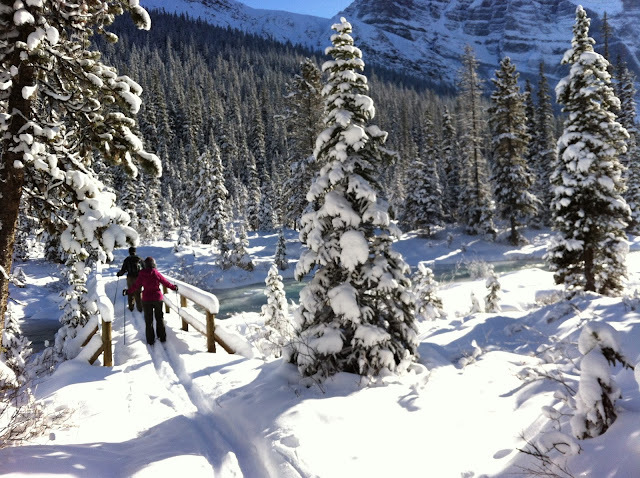 If you want to find groomed and tracked cross-country skiing in November, the Moraine Lake Road at Lake Louise is always good to go by mid-November. This year, the road is already groomed (and it's only the 6th of November,) and if we're lucky, it will be track set by this coming weekend, well before the middle of the month. To follow ski reports and keep up to date with what's happening on the trails, follow Skier Bob's website, Ski Here. 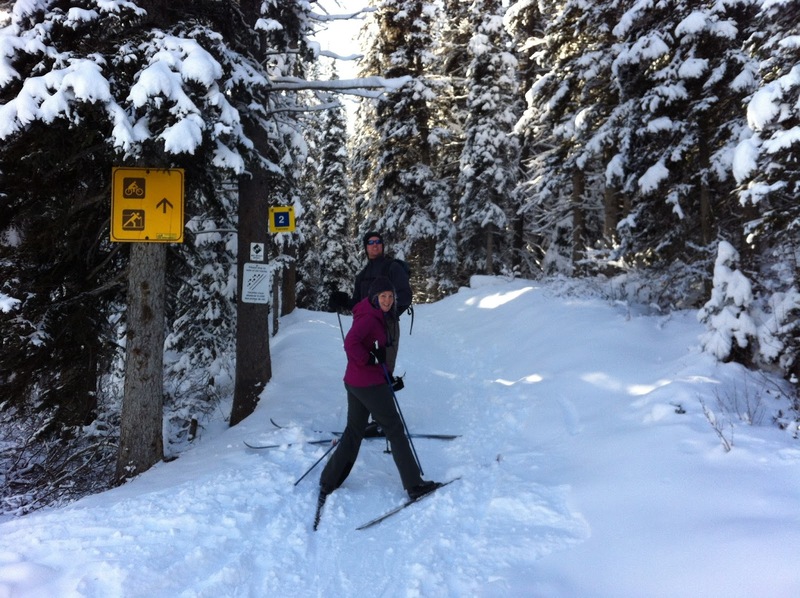 November skiing at Lake Louise - and the snow's not so bad!